The Drug Enforcement Administration (DEA) announced Monday it will allow unused narcotic painkillers such as OxyContin to be returned to pharmacies. Until now, pharmacies were not allowed to accept unused opioid painkillers. The Controlled Substances Act required patients to dispose of the drugs themselves or give them to law enforcement during twice-yearly national “take-back” events. Consumers will also be permitted to mail unused prescription medications to an authorized collector, in packages that will be available at pharmacies and locations including senior centers and libraries, The New York Times reports. The regulations will take effect in one month, the article notes. In addition to OxyContin, the rule will include stimulants such as Adderall and depressants such as Ativan. The program will be voluntary for pharmacies. The DEA will require locations accepting drugs to permanently destroy them, but will not specify how they do it. Flushing drugs down the toilet, or throwing out prescriptions in the trash, are discouraged because they could harm the environment. The next great step would be for the pharmaceutical companies to step up and offer financial assistance in permanently destroying all drugs turned in. If they spent a fraction of their advertising budget on this, it would be a drop in the bucket. 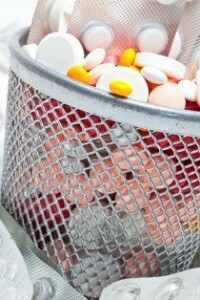 With this assistance, many pharmacies may consider providing the “take back” service. This is a wonderful development and creates a positive condition to get more of these risky drugs off the street. Kudos. Great news from the DEA in its efforts to curb the incidence of prescription drug abuse. When my teenage daughter started high school last year, she came home and announced that her locker was on the “drug corridor.” The stories kept coming as the year progressed. She heard from classmates and fellow “drug corridor” real estate holders that students could access all kinds of “legal” aids for combatting the stress of high school. Kids swapped their parents prescriptions in the hallways, sometimes offering handfuls of assorted colors and mood enhancement. Disposal of unused prescriptions is an excellent first step toward cleaning up the halls. Step two and three? Let’s guide our physicians away from the over prescription of opioids that has become so commonplace and equip our teens with substance abuse prevention education so they can learn to make healthy, educated choices and wipe out the disease that is addiction.